Cn. Nerius was Quaestor Urbanus for the year 49 BC, and stuck coins in that respect. He is not otherwise known. Gens Neria was a minor plebeian family at Rome. Nerius' Quaestorship is the first mention of the family, and few if any others are known to have held Roman magistracies. Many Nerii are known from inscriptions. 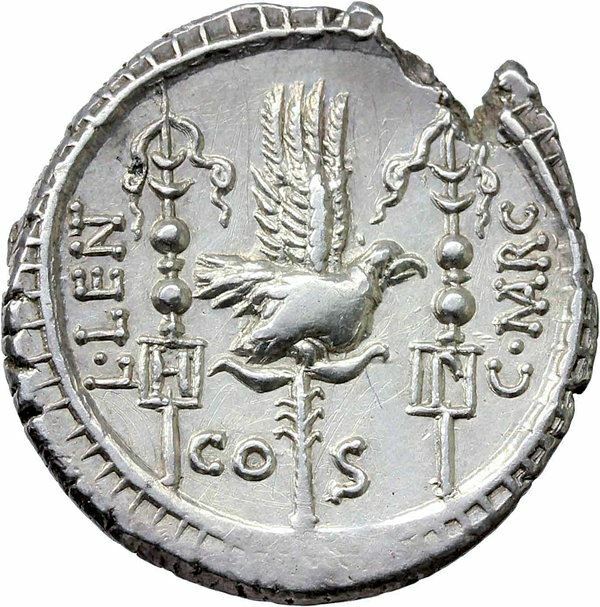 A coin issued by Nerius depicts the head of Saturn on the obverse, and standards labeled with the names of the consuls on the reverse, perhaps alluding to Caesar having broken open the treasury. The nomen Nerius is identical to, and probably derived from, the Umbrian or Sabine praenomen Nerius or Nero, which was traditionally described as meaning fortis ac strenuus, "strong and sturdy". This would seem to indicate that the Nerii were probably of Umbrian or Sabine origin. Such an origin is supported by an inscription from Capua, mentioning an Ovius Nerius, Ovius being a common Oscan praenomen.